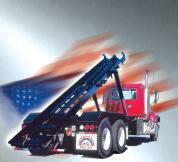 We manufacture the American Roll-Off, Palfinger Hooklifts, and the American Hawk Bulk Waste Crane product lines. These products are sold and serviced by over 50 truck equipment and waste equipment dealers throughout the United States. We provide quality products that are easy to maintain and service while delivering the lowest life cycle cost. We confidently stand behind the products we manufacture, sell and service.